"He had this energy, even when he was sitting there waiting for his meeting, rocking back and forth in his ill-fitting sports jacket with his tie all pulled off to the side. He seemed really earnest about doing the show. You just had the feeling that he was going to be a lot of fun and he belonged here. It was like the show - and I don't mean to sound condescending - but it was like the show had been given this new golden retriever puppy." In the above excerpt, Conan O'Brien is speaking of Chris Farley himself, one of the most well-known comedians in Hollywood history, both for his talent as well as his tragic death that mirrored his idol, John Belushi. 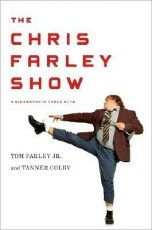 Farley's older brother, Tom along with Tanner Colby have worked together to bring Chris' biography to the public, reliving some of his best comedic episodes as well as unearthing some of his most vicious demons in The Chris Farley Show: A Biography in Three Acts. Once I picked up the book, despite my lack of knowledge of the man, I honestly could not put it down! It is one of the most unique biographies that I have ever read and one of the easiest to read. The format is unlike any that I've read before. Instead of one or two authors completely detailing a person's life, The Chris Farley Show is a composition of interviews done with his family, co-stars, friends, and romantic interests. It paints a portrait of Farley unlike any that I've read before and provides an interesting perspective on his life, including disagreeing perspectives from those close to him. From my limited experience, it seems to me that many knew Farley as this simple guy that fell down a lot, danced around a bit, and could make people laugh by simply making fun of himself. However, throughout the book, I discovered that Farley was a much more complicated individual. He dealt with many demons from a young age and was often encouraged in his debilitating behavior by those close to him. Would I recommend this book? Yes I would! I would recommend it to everyone! It is a tragic ending to such a promising life . . . BUT it is one that can be an eye-opener to many (beyond the Hollywood city limits!) who are affected or know someone who is affected by the disease of addiction (and, yes it is a disease!). It adds the humor of many well-known comedians today, including Chris Rock, David Spade, and Tim Meadows. It demonstrates just how hard addiction is to overcome and how those close to the addiction have no idea just how to deal with it. It shows the hope that Farley felt when he was sober and it went beyond illustration of how deep in despair an addiction can take an individual. It was an absolutely fascinating and inspiring read. I laughed. I cried. And, I was only left with one question . . . Where was Adam Sandler?